Contractor accountant fees – how much do they cost? With such a wide variety of contractor accountants available for you to choose from, comparing contractor accountant fees and costs can ultimately play a large part in how you choose your accountant. The average monthly fee for a contractor accountant typically ranges from around £60 anywhere up to £150, however the service the accountancy provides may vary substantially depending on the price. This is where you need to do your homework and ensure you fully understand exactly what it is you are paying for. It is worth noting that most contractors opt for an accountant who charges a fixed fee, as opposed to one that charges by the hour, simply because it generally minimises the risk of receiving any unexpectedly large bills. However if you fail to check what is included in your chosen package, additional costs may still end up coming your way! What’s included in my monthly fee? Some of the typical services your contractor accountant will perform for you include payroll administration, VAT Returns, processing of PAYE/NI , payments to HMRC, preparation of company year-end accounts, tax planning advice, completing your self-assessment forms and other forms on your behalf. However some of these things may not be included in your contractor accountant monthly fee, and what is, and isn’t, included in your monthly fee will likely depend on how much you are paying them. Again, the inclusion of these extra services will likely bump up the cost of your monthly fee. You may already have some of these things, especially if you are switching accountants rather than just starting out with your first accountant. So if you do not require any of these extras, this is where you may be able to save some money and find a package at a lower cost. Do you need to meet with your accountant regularly, or do you only require telephone/email support? Will you receive unlimited support, or if there is a cap on your questions? What are their average response times to queries? Are they a specialist contractor accountant? Will you get a dedicated accountant manager? What other business knowledge and services can they assist you with? The answers to these questions can have an impact on the amount you pay for your accountant. The key here is think about what kind of service you require, relative to your business needs. For example if you are just starting out then you might opt for a more expensive package that gives you a higher level of support, including face-to-face meetings and unlimited advice from your accountant. On the other hand if you are an experienced contractor you may opt for a cheaper, ‘online only’ package, with capped support received solely via email. It is important to ensure that you are comparing monthly fees like for like. Make a list of the services that suit your business needs, and compare the packages that include all of your requirements in their monthly price. Keep in mind though that fees aren’t everything when it comes to picking an accountant, there are a number of other important factors which you should take into consideration. You might decide that you want to prioritise finding a forward-thinking accountant, whose website and social media accounts are kept up-to-date with tax tips and advice. Or perhaps you will prioritise accountants depending on which professional bodies they are regulated by and what qualifications they hold. Customer service should also play a big part in choosing your accountant, as not only can this affect your day-to-day dealings with them, it can also set one accountant apart from another when their packages and fees are similar. Good customer service is essential, especially when you need the right advice and timely responses from your contractor accountant. 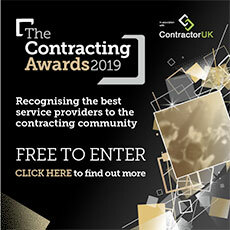 Take a look at review sites, speak to other contractors at your workplace or check out the ContractorUK forum to get an idea of what kind of service levels you can expect from them, and what their reputation in the contractor market is like.